Oh, the joys that lack of privacy brings these days to us techies thirsty for the next rumor. A pretty intriguing project has been spotted under the profile of a Microsoft's hardware manager at LinkedIn. Its work history, posted on the business-oriented social network, is listing him as managing an Acer Windows Phone 7 device undertaking. 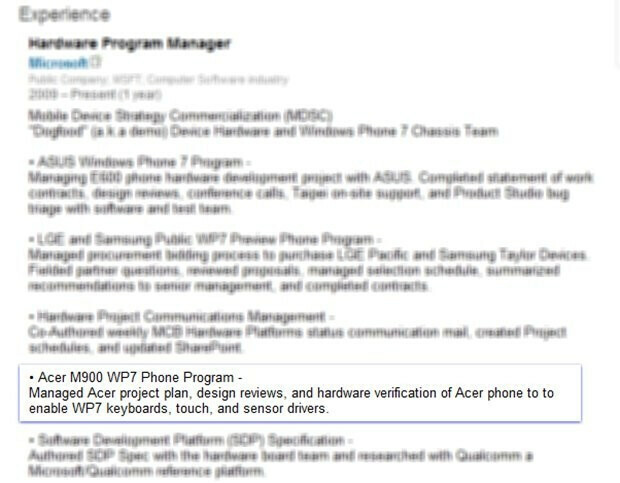 The job included "project plan, design reviews and hardware verification of an Acer phone to work with WP7 keyboard, touch and sensor drivers" - the works. While not in the initial list of hardware partners for Windows Phone 7, Acer is certainly no stranger to using Microsoft's mobile operating systems. An upcoming WP7 device made by the third largest computer manufacturer in the world is entirely in the realm of possibilities. Now all that is left is waiting for this rumor to be fleshed out more with specs and launch date - hopefully by the supposed culprit Acer.